How to Buy a Prepaid Sim Card ( Pay-As-You Go Sim Card ) for Internet Access at London Heathrow Airport or London City Airport ! Once you are through the beggage claim and customs look for a WHSmith Bookstore. I bought my sim card in the WHSmith Bookstore at London City Airport. 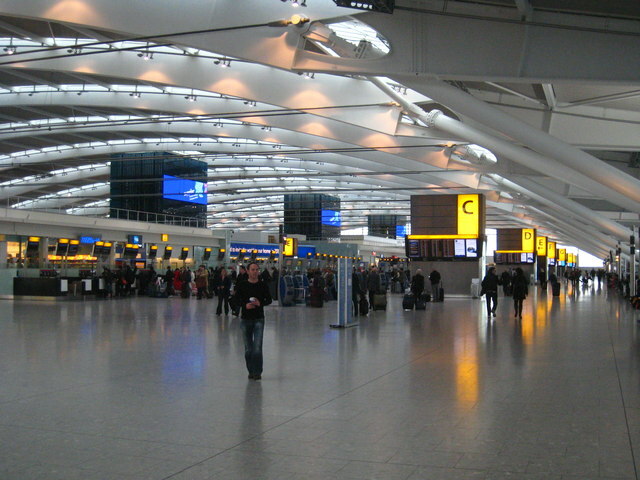 The same bookstore you will find at London Heathrow Airport (see below for more details) or other London or UK Airports. This time I bought a Virgin media sim card, which uses the Orange Network in the UK. It will not have any money on the sim card so I also asked immediately for a top up for 10 Pounds. I did not have to show any ID-card. The Pay As You Go sim card itself costs 1.90 Pounds. I had to go to Settings > Wireless & networks > Mobile networks > Network operators. This will initiate a search for available telephone networks. I selected the Orange PCS Ltd 3G network to get access. Once you have access to the network you need to call 789111. Here you will be guided through until you can enter the 16 digit number on your top up voucher (from WHSmith for 10 Pounds). Switch off your phone. There is a WHSmith Bookstore for example at the departure floor before going into the security check. I bought a Pay As You Go PAYG prepaid sim card from Vodafone at London Heathrow Airport at Terminal 5. The PAYG sim card costs 1.99 Pounds with zero balance on it. I also purchased a top up for 10 Pounds. You need the telephone number as soon as you want to contact the help line of vodafone. You have looked forward to your next home office day. This is the day where you want to get all these things done that are usually difficult to achieve at work. You have planned to read a key report, fill out budget plans, answer important emails, do some key research or prepare your next presentation. All in all you have this long list of important things you really want to get done with but as soon as you sit at your home office desk you realize that you are lacking the energy and concentration to fully focus on your work ahead. You read and read but you seem to never caputre anything as your mind is wondering off again and again. You start writing an email, but suddenly you find yourself staring on your blank page because you are struggling to form any sentences. This is the moment you know you should have either stayed in bed or you would have been better off taking a break, go out and run or drive to the gym and exercise. While you debate this thought you notice that the weather is not in your favour nor do you feel like packing your bag, drive to the gym, do your workout, take a shower, come back afterwards. On top of it you start to feel guilty as work is not going as planned and it seems illogical and prohibitive to you to spent the time required to go out and exercise as every minutes count. Your emails mount, calls are unanswered and you know that you have a deadline just ahead of you. This is a dilemma, neither can you get your work done because your mind is empty and tired nor can you invest the time for exercising in the gym. The good news is, there is new research on exercise. The Massachusetts General Hospital examined the metabolic response of 70 participants. Just 10 Minutes of high intensity training changed the positive metabolite signatures in the blood significantly. This metabolic change leads to an improvement of insulin sensitivity (niacinamide) and fatty acid oxidation (loose calories faster) and a number of other healthy metabolites. And most importantly the positive effect will continue to last for 1 hour after the exercise while at the same time people feel better and more energized during this period. Don’t you want to feel better for one hour and overcome procrestination? Instead of going to the gym whicht takes a lot of time or run in the rain or snow you can just do a short cardio high intensity workout in your home office for less than 10 minutes. I have tried it myself and was surprised how much more I got done in the one hour after the excercise. With this new surprising insight I asked myself what would happen if I repeat the workout after every hour of work. Will I still experience the positive effect for the next hour after my excercise ? To make a long answer short, yes I did. At the end of the day I got lots more things done than planned while at the same time my fitness increased. And on top of it I did not feel tired but joyful in the evening. And also the next day I could repeat the same sequence again even with more sets than the previous day. I was quite surprised. It seems the 1 hour recovery time between each of the sequence will allow to continously increase the workout eventually over time. If you have the opportunity to work out over several days in your home office you will also have the positive side effect of loosing weight. But before you jump into exercising and this is my long answer there are a few things to consider. First of all consult with your doctor if you have constraints in your flexibility or any other chronic diseases etc. and second it is good to know some of the key principles for cardiovascular training and high intensity interval training (HIIT). The amount of muscles involved should be 1/6 of all your muscules. If you train your two arms this would account for 1/6 of your muscules or you two legs. The heart rate during the exercise should be based on your biological age which can differ from your true age. Here it is probably best to consult with your doctor or if you want to start right now just take your current age and substract it from 170 for a very rough estimation. In the exercise you should reach at least this calculated heart rate. “HIIT is a form of cardiovascular exercise alternating periods of short intense anaerobic exercise with less-intense recovery periods. Usual HIIT sessions may vary from 4–30 minutes. These short, intense workouts provide improved athletic capacity and condition, improved glucose metabolism, and improved fat burning. (Reference: Wikipedia). The HIIT workout routines at home listed below will last between 4 to 8 minutes and not more. 10 minutes is not a dogma when you can get the same results in 4 minutes. There are exercises that will include 1/6 of your muscules and will get you over the threshold heart rate. It is up to you choose if you just do one or several workouts during the day and it is up to you decide what type of exercises you select. I have collected my exercises from several sources. It does not matter if it is from pilates, yoga, qigong or any other type of workout regime as long at it follows the key principles of cardio vascular high intensity interval training. The key is to have a warming up phase before you go into any intensive workout. If you have any other suggestions please share. I do the first 4 exercises in the video. Lie on your stomach face down and lift both legs upwards as many times as you can. Lie on your stomach face down and lift your upper body and head upwards as many times as you can. This is an ideal number of sequences. Not every day often will permit to go through all the 9 sequences due to meetings and other committments. Just select a few and do the other exercises on another day. The focus is clearly on getting energized for the next hour and to be more productive at work. If you would combine all nine sequences and complete those in hour the effect will not be same. Usually after such a longer workout the energy will first go down before it will go up again. So instead of cramping all the exercises into the evening by spreading those across the day the impact is much higher and you reach much higher energy levels immediately after the routines. I have done competitive sports when I was young and I was in the national team for a period of time. I also had the opportunity to watch closely the workout routines and practice from World Class sportsmen in the training camps I went to. One thing I observed is the same that Aladar Kogler wrote in one of his books: “Those athlets who place an undue amount of importance on their results suffer and those who achieve stable, constant performance look at their sport as an important, but not the only, part of their life”. Treat your workout as a journey, a journey from hour to hour and just observe what is happening. Treasure the experience and keep a diary about the feelings and the energy after every workout. With the time you will find your best workout routines and probably after the first day you will already feel the energy coming back. Yoga for Athletes by Aladar Kogler, Ph. D.. Aladar Kogler he was hte U.S. Olympic coach for both the Seoul and Barcelona Fencing Teams and three-time U.S. Pan American Coach.